100% NRV vitamins B6, B12,Thiamin (B1), Riboflavin (B2), Niacin (B3) and Pantothenic acid (B5). Riboflavin (vit. B2) contributes to the normal metabolism of iron, known for contributing to the normal formation of red blood cells. Together with vitamins B6, B12, niacin (vit. B3) and pantothenic acid it contributes to normal energy release and the reduction of tiredness and fatigue. Vitamins B6, B12 and folic acid contribute to the normal function of the immune system. 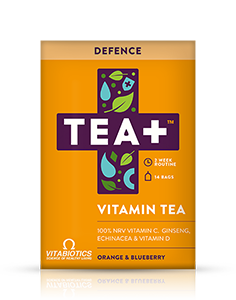 TEA+ Energy is available in the UK from Boots, pharmacies and health stores including Holland & Barrett. Alternatively order online here. Green Tea, Yerba Mate (19%), Natural Flavouring, Vitamin B complex [ Biotin, Niacinamide, Pantothenic Acid, Vitamin B2, Vitamin B6, Vitamin B1, Folic Acid, Vitamin B12, Mannitol*(wheat)], Vitamin C, Hibiscus, Ginseng (1%), Cardamom. Allergy Advice: For allergens, see ingredients in bold. How often should you drink TEA+ Energy? Is TEA+ Energy safe for those with a gluten intolerance? Is TEA+ Energy suitable for vegetarians and vegans? 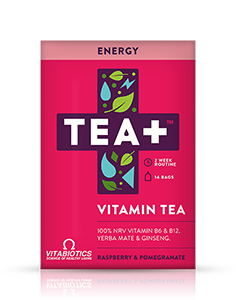 Does TEA+ Energy replace my daily multivitamin?